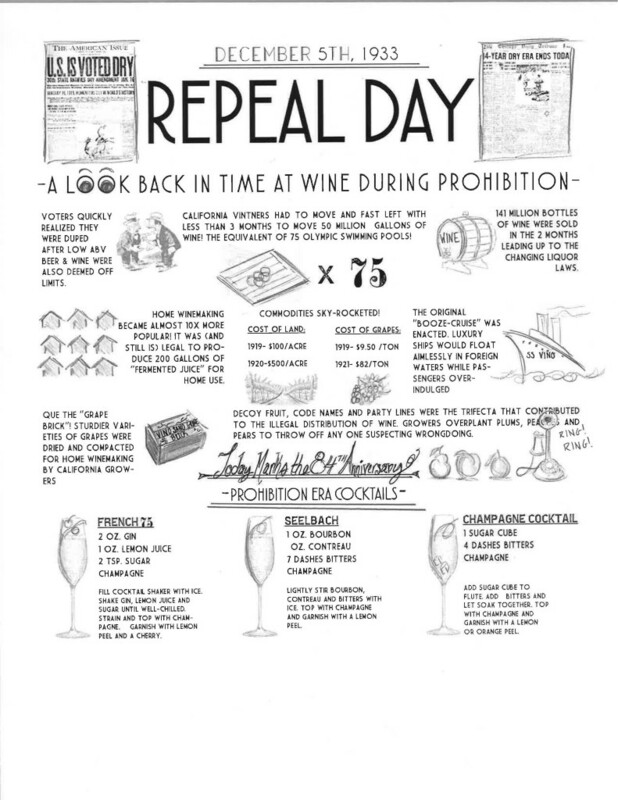 Repeal Day — Heritage Wine Cellars, LTD.
but what about other industries under the umbrella of outlawed alcohol? Examining the impact and aftermath of Prohibition helps to paint a vivid picture of progress within an industry that we love deeply. In 1933, the damage from the dark days of the temperance movement could be seen throughout beloved wine country. Soil quality was degraded and grapes of any merit had been replaced with sturdier varieties suitable for making ever-popular “grape bricks”. America’s taste for wine had also changed. Wine was a booming industry prior to Prohibition but 13 years had taken a toll on the public’s perception. What was once a staple became barely palatable homemade swill. That being said, the end of Prohibition sparked a grass-roots Renaissance in the wine industry. A man named André Tchelistcheff, redefined the way in which wine was made. Credited as the most innovative post-prohibition winemaker, André took great measures to establish a style and standard for wine making as well as spending his career consulting with other estates and mentoring budding winemakers. With this huge contribution, it would take nearly three decades to rebuild from a vinticulture standpoint, but it was this rebirth that contributed to the bustling California, Oregon and Washington wine industry we know today. Numerous industry giants emerged and US wine would never be the same. Today, The US Wine Industry is BOOMING and growing; Holding the ranking as the 4th largest producer of wine! It’s safe to say it was a long road of innovation, passion and perseverance but quite obviously worth it! So pour yourself a glass of your favorite libation (it’s legal!) and celebrate Repeal Day! Cheers! Newer PostI’ll Drink To That! Older PostBon Appetit and Cheers!